Iggy Azalea Drops Off New EP "Survive The Summer"
Iggy Azalea drops off her new EP "Survive The Summer" featuring Tyga & Wiz Khalifa. Iggy Azalea surprises fans with some new tunes. A new mixtape from the First Lady of Grand Hustle, Iggy Azalea. "TrapGold" has one lone feature from Juicy J, and production from Diplo & FKi's 1stDown and more. Grand Hustle's rapstress Iggy Azalea drops her EP "Glory." The five-track Extended Play has features from B.o.B., T.I. & Mike Posner. 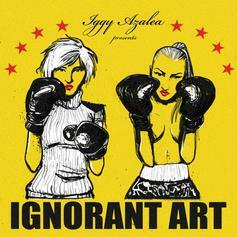 Give Ignorant Art a spin - it's the latest tape from Iggy Azalea, having dropped on Wednesday, September 28th, 2011. Iggy Azalea's musical situation is improving with every new release, and Ignorant Art will most definitely help the cause. It's a fine addition to the growing body of work Iggy Azalea has been developing since stepping foot in the game. We're looking forward to what Iggy Azalea has in store.